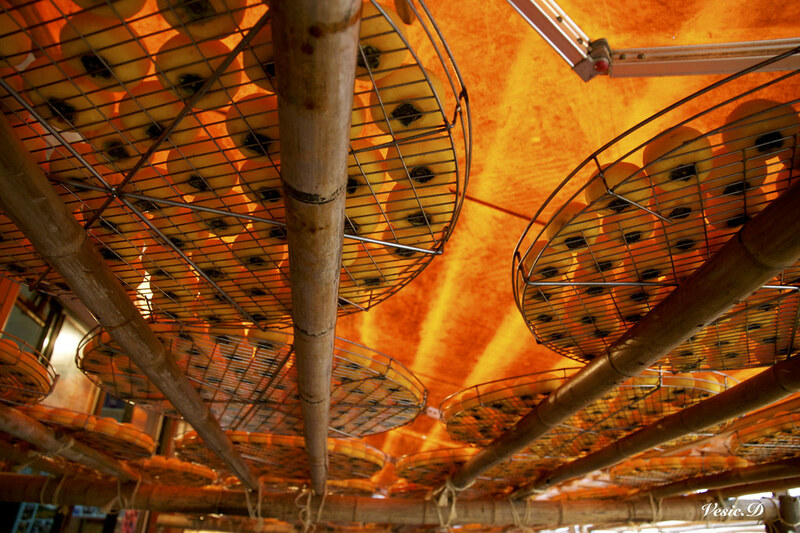 In front of the san-ho-yuan traditional building, piles of bright-orange persimmons sit on the arbor, drying under the sun. This is the famous scene in Hsinpu, with fluctuant hills, dry weather and strong autumn wind- a super suitable condition for making dried persimmons cake. But luckily, we came on a drizzly date, the persimmon family were covered by big persimmon-orange canopy. Where is my clear blue sky! 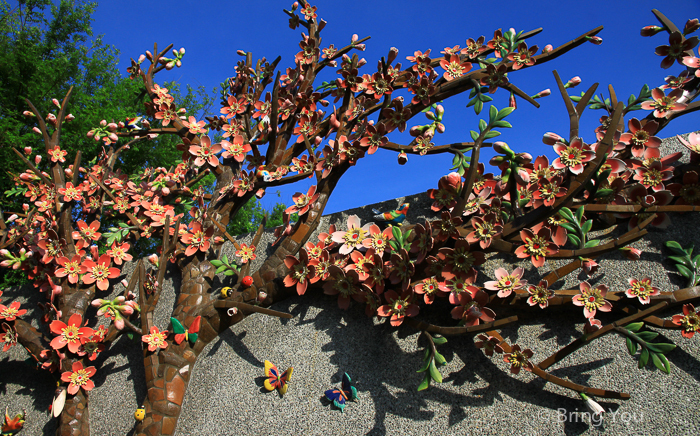 Walking up the hills, we pass an elementary school, they have a long wall covered with ceramic persimmons trees, and many different names on the persimmons on its branches. Broadcast rumbling loudly from the school, rewarding the gold metal to the winner class. We stop by to take a look, parents standing around the playground to take picture of their child, recording their outstanding performance and glorious figures on the stage. Surprisingly, there are just near 150 kids on the playground, this is an elementary school consist of children from first grade to six grade, but only 150 kids? how many classes are competing with each other at the same grade, two! My elementary school is not in the center of the city, but a little suburb, at the time, we have at least 15 classes, more than 400 kids a grade, but in this small town, the total number of the kids in the school is far from mine. Birth rate in Taiwan is getting lower, it’s one of the lowest of all the countries in the world, although we are in a more countryside orchard ground, but a school with this few members is quite a news to me. 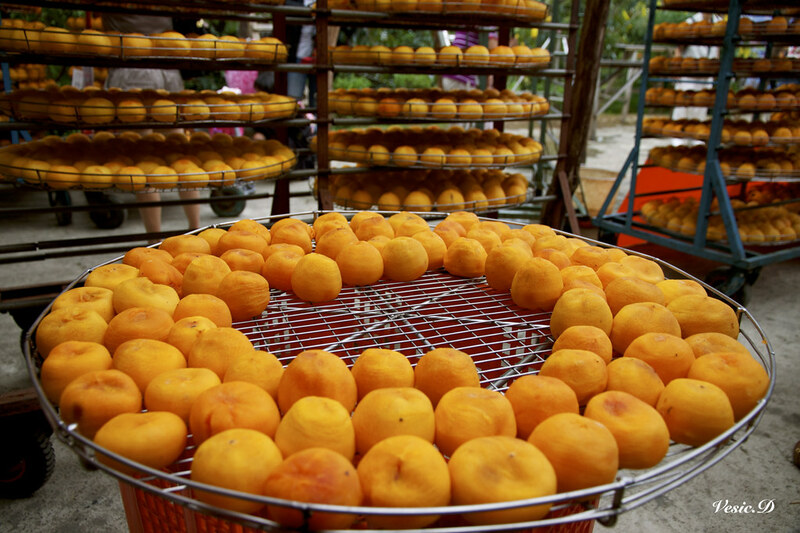 But these kids have abundant orchard back of their school, they learn lots of persimmons cake making process and Hakka culture in Hsinpu, with those who might stay working in their hometown to enhance their persimmons cake culture, quantity is not the problem, but the quality! We arrive Wei Wei Jia orchard quite easy with their clear persimmon sign, we join a van load of tourists walking into the persimmons factory. The rain and coolness on the hills have made us stuffy, so we are quite happy to find that, the orchard family offer their homemade warm persimmons tea to all photographers and tourists, it helps a lots in this cool weather, I am grateful for their enthusiasm. With a cup of warm persimmon tea, we sit together with other tourists in a circle, listening to Miss Liu talking the history of their family business and process of making the persimmon cake. “Before drying the persimmons, there are three processes, picking, washing, and peeling" Miss Liu directs to the right, there are some workers sitting on the wooden bench peeling the persimmons. 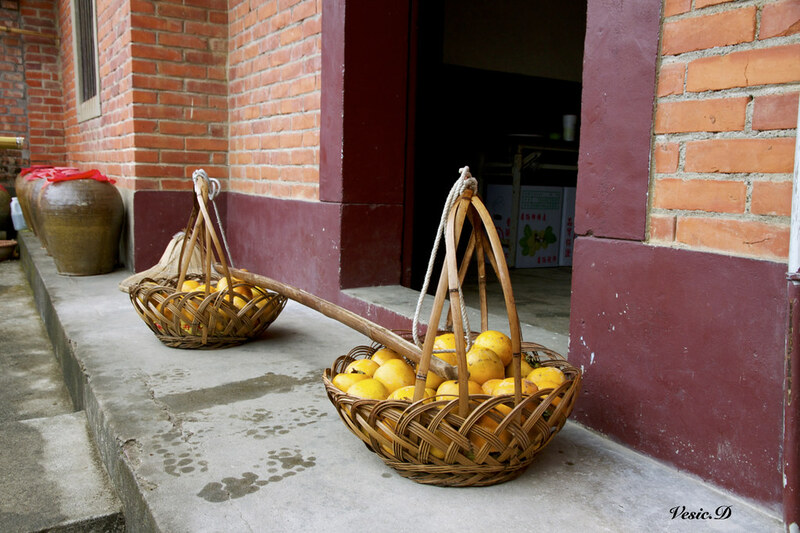 “Then goes to drying, persimmons are pretty scared of rain and the wet air, the humid weather will ruin the effort we have done for the persimmons, we do not want rotten fruits. 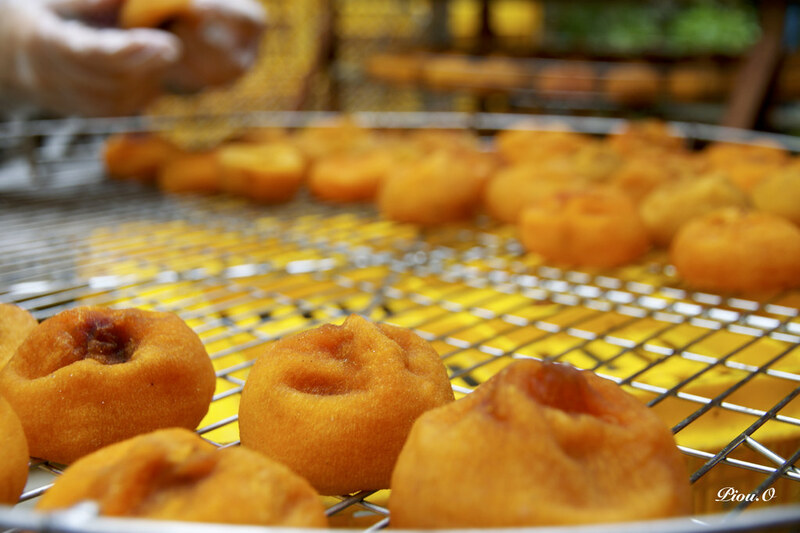 Thus, you can see workers bustling pushing the persimmons into the oven." We followed Miss Liu to the big oven, finding there are already hundreds of orange-bun look persimmons hiding under the bake room under the stairs. It’s conceivable then, the persimmons like sleep in the oven. Even I wish to stay inside for some hours to get away from this hell weather. “The persimmons laid on the arbor for three days until it become soften and light brown, then will be delivered to skilled master for pinch" We watched those masters nimbly pinch the center, to fix the shape of a persimmon cake, but our attention are drew by a yell. “Do you know why we separate each persimmons from each other with a finger’s space?" Some naughty children surround one arbor pinching the persimmons, while a man standing in front of them teaching the right pinching ways of the persimmon cake. “No one knows? Don’t worry, even the other persimmon farmers don’t know, this is the secret wisdom owned by Wei Wei Jia “He says proudly. 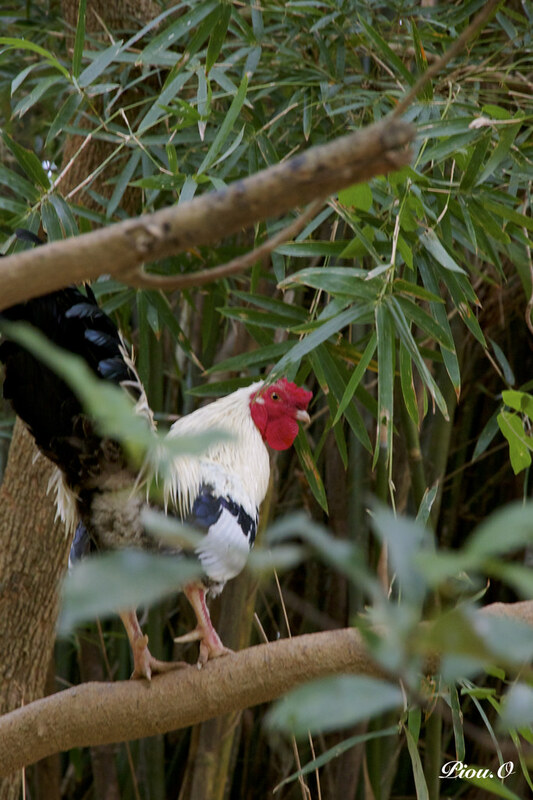 “To prevent them from decay, we don’t want to see them die because of being too intimate." Well, I think I prefer pinch the persimmons cake more. But thanks to their detailed explaining, I got the idea that we have to dry and pinch the persimmons repeatedly for about 12 days until the persimmons is sufficiently dry, and we got the persimmon cake into our mouth, that’s what I waiting so long for, a soft, brown cute bun. We walk around the orchard and find some nice Pen persimmons on the trees, with fresh rain drop on it, there’s a board hanging on the tree say the difference of three kind of persimmons. 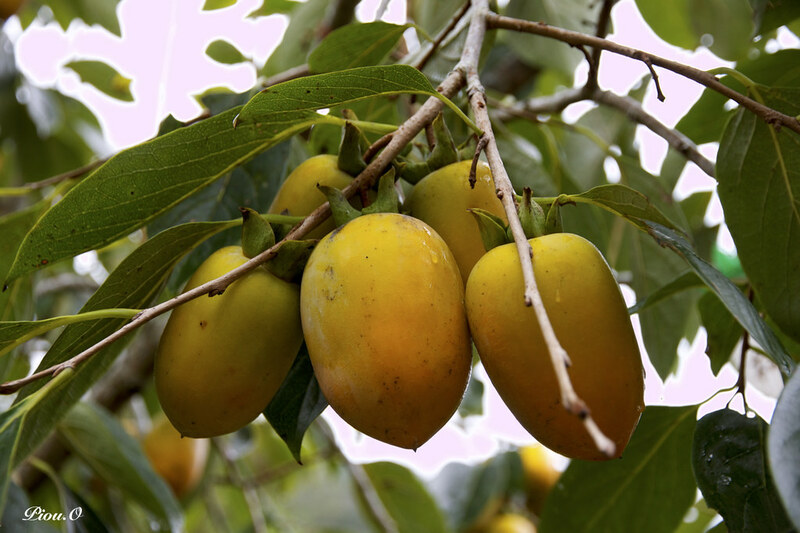 The one we see on the tree is easy recognize, Pen persimmons, long and shaped like beetle nut, I really want to taste some of these persimmon cake, I run to the counter, checking the cakes no the tables but couldn’t find a pen persimmon cake. I ask the seller"Why is there only Bull persimmons cake? Are there any Pen persimmon cake?" “The pen persimmons are still on the tree, girl. "The seller says in a polite manner. Yes, it is on the tree, so the fruit on the tree won’t be sold now? The seller keeps saying"We only sell bull persimmon cake now, the time of pen persimmons’ maturity is two-month longer than the bull persimmons and the stone persimmons"
So the persimmons on the arbor are bull persimmons and stone persimmons, perhaps that’s why all the persimmon cake I see is in a flat round shape(the stone persimmon is round but smaller than bull persimmons), not in a flat pen shape. 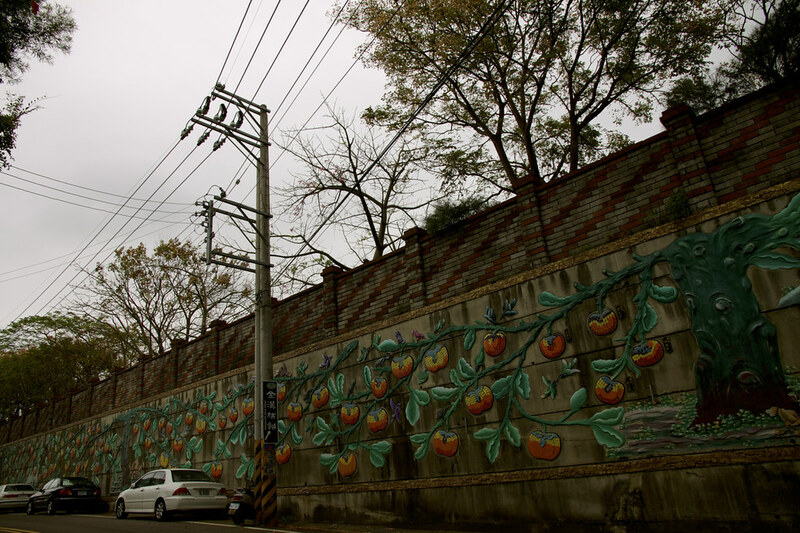 Leaving the persimmon cake factory, we walk along the road to the traditional san-ho-yuan. “It should have hundreds of little orange persimmons spreading racks of racks on this square, now only the bamboo racks, all persimmons hiding into the oven" I murmured to Vesic, and watch a team of cyclist taking a group photo in front of this three compound building. Culture, Culture, Photo Series, Taiwan Story orchard, Persimmon, taiwan. permalink.